Facebook on Friday announced initial testing of end-to-end encryption in Messenger, which should keep some conversations secure from any possible intrusion, even by Facebook itself. 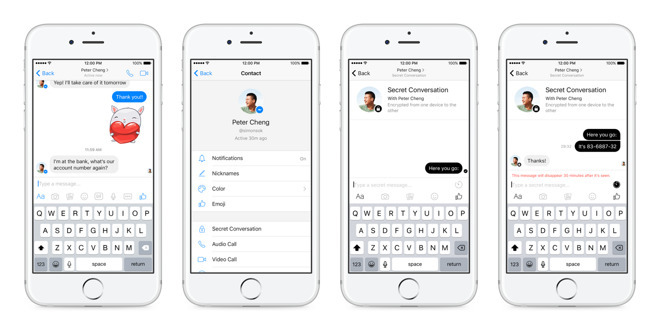 A limited number of users should now be able to launch "Secret Conversations," Facebook said. The company is relying the Signal protocol developed by Open Whisper Systems, which is also used by Facebook's other messaging service, WhatsApp. People can set timers for how long messages will remain visible, but Secret Conversations are otherwise more limited than regular messaging. Participants can only view them on one device, for instance, and they don't support any "rich" content such as videos, GIFs, or personal payments. A wider rollout of the feature is due sometime this summer. In the meantime Facebook will be collecting feedback, and readying tools for reporting "objectionable" material. Facebook Messenger has been an unusual holdout in the trend towards end-to-end encryption. The company is thought to have worried about accommodating bots, since by definition some data would have to be visible. Even as an opt-in feature, Secret Conversations are likely to irritate some people in law enforcement, politics, and intelligence, who have complained about systems like Apple's iMessage "going dark" to investigations. Facebook Messenger alone is used by over 900 million people.